Hastings 1066, originator of the “Break the Line” series, a simple 30-45 minute card game that nonetheless reflects the maneuver and geospatial relationships of warfare, has successfully Kickstarted. The KS says the game will be delivered this May. It is still available via Worthington Publishing’s preorder system for $24 (list $35). Lots of dicing in this game. From the same publisher, Crashing Suns, first of the Diceless Wars series of diceless, cardless block games, is on preorder at Worthington Publishing. This game, and this series, is as good as my best. They are two-sided (and sometimes three-sided) games, 15-60 minutes. Plastic Soldier Company (PSC Games UK) aims to publish Pirate Captain by GenCon, but I wouldn’t be surprised to see that slip. People enjoy this game as much as any of my games. It is not (at least, not yet) part of a series. Lots of dicing here. It’s a combination of historical and romantic pirates. PSC is also publishing Germania, NOT a Britannia-like game despite the title. It is a hybrid peace/war game, a game of Germanic tribes surviving many invasions after the fall of the Roman Empire. It uses battle cards rather than dice. 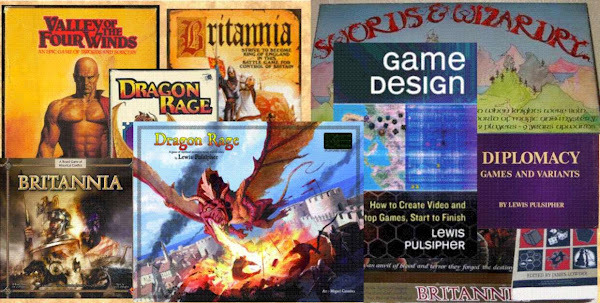 Strategic Decisions (S&T and other magazines) has two Britannia-like games, Barbaria and Frankia. They are on the preorder system. I don’t have much information about what’s happening. Barbaria uses dice, Frankia uses battle cards. Seas of Gold, another peace/war game that’s first of a diceless series (Viking Gold, Stars of Gold), is at Excalibre Games. It is one of my best games. Whether they will be able to publish it is another question. The publishing business is hard, especially for independents. That’s all I can think of. I have lots of good, playtested games (especially space wargames), but I’m poor at marketing (licensing) them, especially the non-wargames. (I don’t self-publish.) I keep telling myself I need to do more, but there are videos to make, books to edit, a bi-weekly column to write, life to live. And, someday, Britannia 3rd edition. Ones nearly ready? Lots. But my present favorite is Mandate of Heaven, second of the diceless wars, Doomfleets, freeform and somewhat chaotic Britannia in outer space, and Annihilation, a co-operative space wargame where, even if you win, half the galaxy is destroyed! I also have two or three video courses “almost done”, and several books in various stages of needing editing. *Shakes head*. Britannia 3rd Ed, yes, please!